Tired of having rocket parts rain down on his village, a Russian shepherd is suing Roskosmos, the Russian space agency, for one million rubles after a 10-foot piece of space trash hit his property, narrowly missing his outhouse. 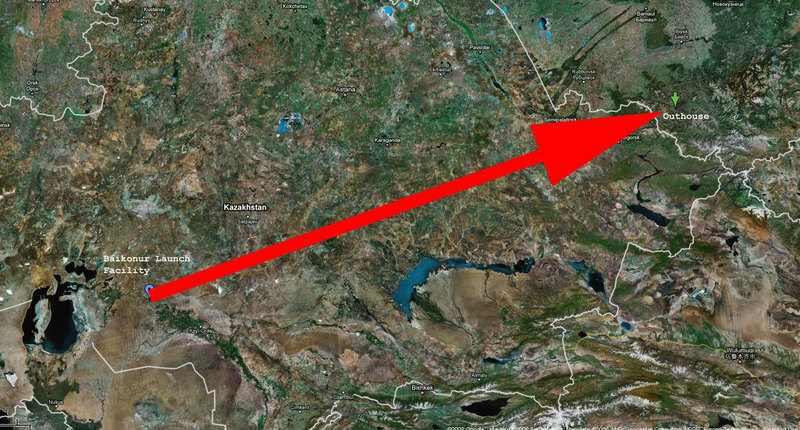 Boris Urmatov lives in the village of Kyrlyk in southern Russia, evidently right under the flight path for rockets taking off from a Russian launch complex in what’s now Kazakshstan. Residents in Kyrlyk and surrounding villages said that rocket parts regularly drop from the sky there. "Sometimes it’s smooth metal casings, sometimes it’s bolts," said a resident of nearby Ust-Kan. "I remember something like an engine fell once." Coincidentally, Russian rockets are powered by something like engines. According to Urmatov’s sister, "Something woke him up in the night, like something exploded. Since he’s visually handicapped [especially in the dark] he didn’t notice the fallen rocket parts" in his yard right away. "But in the morning in front of the shepherd hut he saw this enormous metal casing, as smooth as an egg," she said. "It nearly crushed the outhouse." A spokesperson for Roskosmos said it warns residents when there is going to be a launch, I guess so they can avoid using their outhouses during that time. He also dismissed any concerns about rocket safety. "Technologically speaking," he said, "these parts are supposed to fall off during a launch. They fly, they fall, they fly, they fall. It’s how they work." I remember the guy who sold me my first car saying something like that. "If a court determines that, yes, those are rocket parts," he continued, and "they fell on his land, then for sure he will be compensated. No question about it. We live in a civilized, law-abiding country," he said, although they actually live in Russia. "What is abnormal is when somebody gets greedy, and it turns out the parts did not fall on his land, but that they were dragged there. Those moments are not good." Russian legal experts speculated that instead of compensating Urmatov in rubles, the government would likely move him to Siberia for "safekeeping."